Welcome to Coastal Cone Ice Cream! We’re a local favorite, and have been in the Ventura Harbor Village for 33 years. With over 40 flavors of ice cream, we’re sure to have your favorite! Stop by for one of our custom sundaes, or sample a seasonal sorbet flavor. We make our own waffle cones in-house, and are happy to customize your order. It’s OH-FISH-AL! Taiyaki now at Coastal Cone! 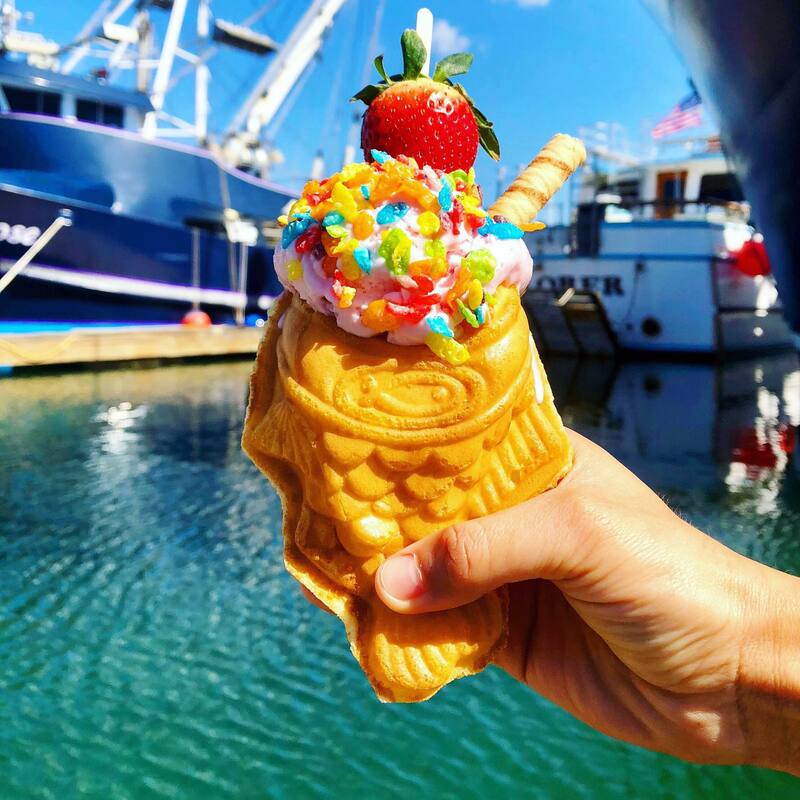 Taiyaki is a a unique and tasty fish-shaped waffle cone! With this sweet handcrafted dessert, you will be able to choose from 40 different ice cream or soft serve flavors, a yummy filling such as strawberry tart or nutella, and top it off with your favorite toppings! Also new at Coastal Cone is Soft Serve Ice Cream! Come enjoy Vanilla, Chocolate, Pineapple, or the alternating soft serve flavor of the month when you come to Ventura Harbor Village! The world-famous Dole Whip is now available, and you don’t have to go to Disneyland to get it! This pineapple treat is vegan, dairy-free and gluten-free, and only 80 calories per serving. Sample a cup, or try it in a Pineapple Float. One of our most popular sellers! Coastal Cone Ice Cream is open Mon.-Thurs., from 10 am – 9:30 pm. On weekends, we are open: Friday from 10 am – 10:00 pm; Sat. : 10 am – 10:30 pm; and Sun. : 10 am – 9:30 pm.